Let the prospects come to you! ― Francois Gossieaux, The Hyper-Social Organization: Eclipse Your Competition by Leveraging Social Media"
We are past the days of door to door sales and telemarketing. All thanks to technology. Technology has made it possible for you to never have to leave your room to search out prospects. Email marketing, social media marketing and blogs have made it possible for you to share your expertise with the outside world. Friends, clients and the like are all sharing, commenting and liking the information that you have to offer, which there is no better marketing than word of mouth. And social media marketing is the best platform of all for a word of mouth campaign. News travels fast, especially in this day in age. Anyone with a camera and an idea can develop a project and promote it all with the touch of a couple of keystrokes. 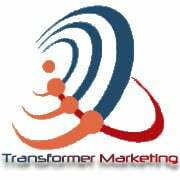 This is exactly what Transformer Marketing specializes in. We offer Email Marketing, social media marketing (targeting Facebook, LinkedIn and Twitter), and we offer Blog Marketing. Your Marketing Specialist will oversee everything and work one on one with you to design the best marketing plan for your business. All the marketing that we do for you is designed for your targeted audience. We monitor your Facebook, LinkedIn and Twitter pages (we can even set them up for you if you don't have one already!) and your custom blog platform. We also offer al a carte services such as SEO (search engine optimization), website design, and much more! Give us a call today at 909-547-5212 ext. 5915 or email us here, for more information. We cater to insurance companies and financial institutions.